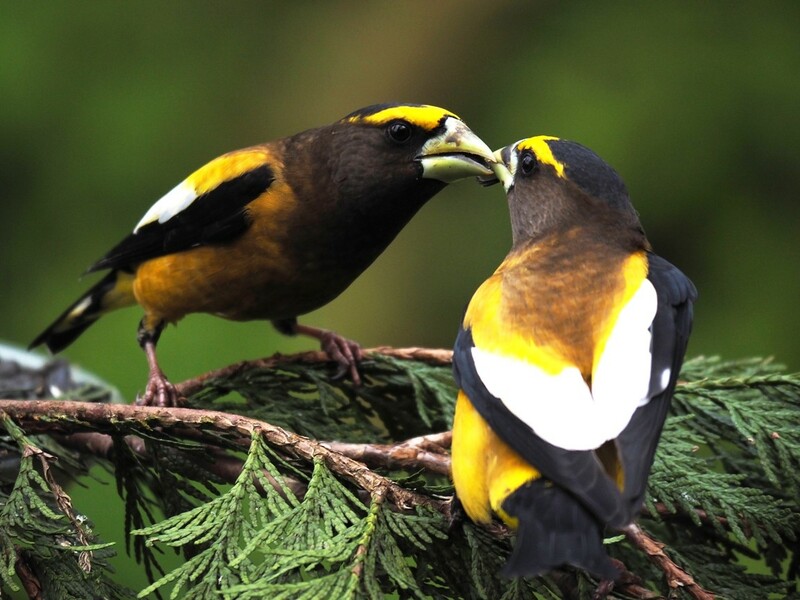 Very exciting day yesterday, the evening grosbeaks arrived about 8:15 am. They arrive once a year in the spring and they are a few weeks later than their arrival last year on April 11, 2016. They are immediately noticeable not only by their colouring but by their size. As I look out my window to the bird feeder that is the first thing that catches my eye. The size difference from the house finches and pine siskins who are dominating the feeders at the moment. 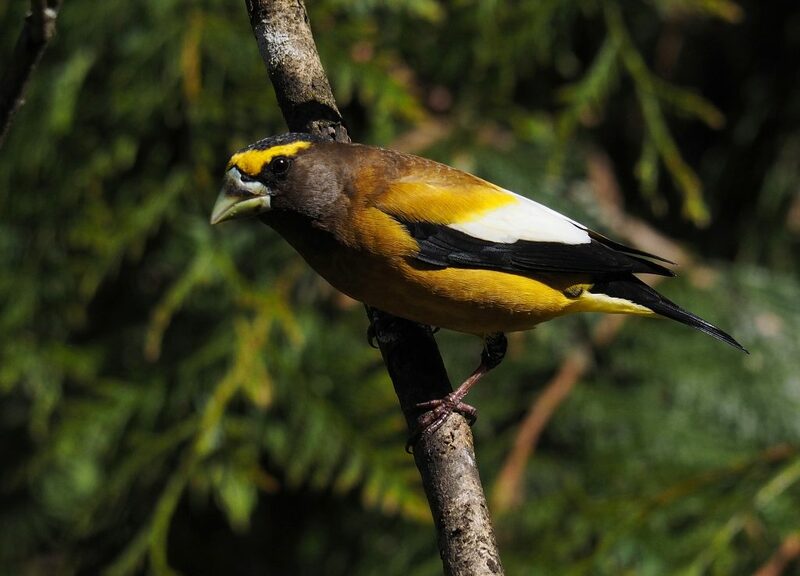 The evening grosbeaks are a finch and while it stops briefly at my feeders it is actually heading much further north to breed. Their favourite habitat is a forested area at higher elevations which supplies lots of food and cover while raising their young. 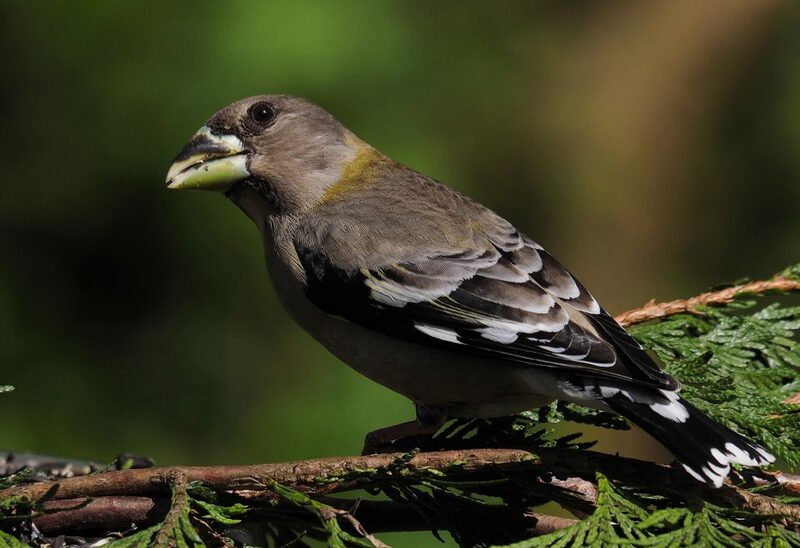 The male grosbeak is a splash of colour in the green of the woods. 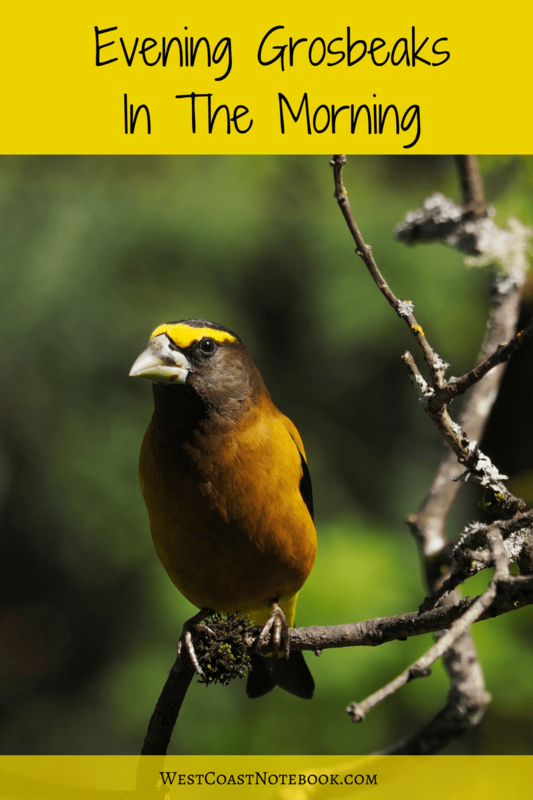 With his yellow crown, heavy beak, golden body and black and white wings, he stands out above the crowd. They always arrive so suddenly. One minute I look out at my feeders and there are just the regulars and the next moment there are half a dozen grosbeaks there loading up on black oil sunflower seeds. 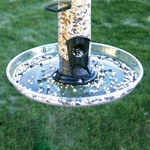 The favourite way for them to eat is from the trays that I have below the feeders to catch seeds rather than from the feeders themselves. They perch on the side and eat double time. As a matter of fact its hard to take a picture of one without food in its mouth. I got a brand new feeder last year for Christmas that is supposed to be perfect for grosbeaks and larger birds, but they just ignore it. 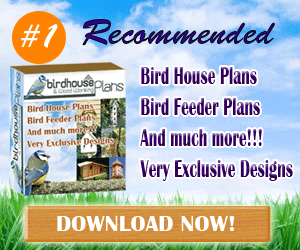 Ah well… you never know what a bird is going to like. The female is quite a bit more subdued than the male and would be almost dowdy if she didn’t have a yellow collar. She is a grayish brown colour overall with black wings and black and white tail. As she is the one that will be nesting, most females of the birding world are a drabber colour than the males so they blend into the scenery and nest. As soon as I saw them I put up my blind (it’s a hunting blind) onto our deck and waited. It didn’t take long until a female arrived and shortly after that a male and then the rest followed. When I’m in the blind the birds just ignore me as there is only the lens of my camera sticking out. This is one of the few times that I use a tripod as the light can be rather low in the backyard. Leaving chores behind, I snapped my heart out taking pictures as you never know how long they are going to stay. They might be here for a week or only the day. …and that might have been my only window of opportunity as today… they are gone. This photograph was taken just before they all flew off for the day. It’s of two of the males fighting over a seed and one grabbed the other by the beak. Hopefully, they will return or another flock will grace my backyard with their presence and if so, the camera is at the ready.